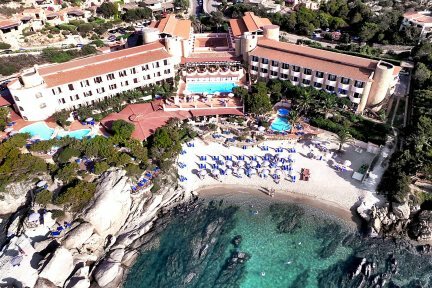 A fantastic 4-star hotel enjoying a top location amid the coastal bliss that defines Baja Sardinia. Upon arriving at this top hotel, guests will identify an atmosphere of exclusivity and authenticity, in everything from the hotel’s location to its presentation, something typical of the sophisticated character of the Costa Smeralda region. Extending through a verdant Mediterranean garden and boasting direct access to the sea, natural beauty is a key characteristic of any stay at Grand Hotel Smeraldo Beach. 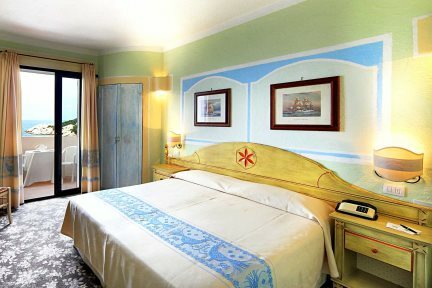 The hotel offers a choice of 160 rooms, comprising three categories: Hill Side rooms, Sea Side View rooms and Front Sea View rooms. 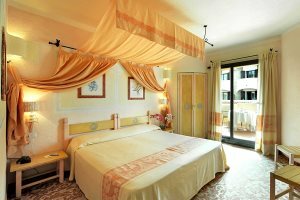 Whatever category you choose, you’ll enjoy Sardinian-style décor and furnishing, as well as a range of good room facilities, including satellite TV, air-conditioning and mini-bar. The views are also very appealing, best enjoyed from the balcony or terrace which also comes as a feature with each room. As well as providing direct access to an inviting beach, the hotel boasts many other alluring features and facilities, including two restaurants and two bars in which to wine and dine on wonderful Sardinian and other Italian cuisine. The hotel also benefits from four swimming pools, two of which come equipped with a whirlpool, extending over multiple levels and affording some wonderful views and fantastic settings for relaxation. 4 swimming pools, small private beach equipped with beach umbrellas and sunloungers, fitness area with sea views, tennis courts 200m from hotel, Wi-Fi, room service. Satellite TV, wireless internet connection, telephone, mini-bar, air-conditioning, balcony or terrace. Side Sea View rooms are furnished in a typical Sardinian style with twin or double bed, all include Wi-Fi, satellite TV, mini-bar, hairdryer, air-conditioning, and balcony. Hill Side rooms are furnished in a typical Sardinian style with twin or double bed (third bed or cot available), all include Wi-Fi, satellite TV, mini-bar, hairdryer, air-conditioning, and balcony. Front Sea View rooms are furnished in a typical Sardinian style with twin or double bed (third bed or cot available), all include Wi-Fi, satellite TV, mini-bar, hairdryer, air-conditioning, and balcony. Nearby Poltu Quatu was built to resemble an ancient fishing village and despite being small and a relatively new development, it blends perfectly within its natural environment, creating a picture postcard dream. Situated between the lively resorts of Baia Sardinia and Porto Cervo, there is a wide variety of shops, bars and restaurants within a short drive of the hotel. Phi Beach at Baia Sardinia is perhaps one of the trendiest places in Sardinia to watch the sun go down with a pre-dinner drink, whilst Porto Cervo is home to some of the best restaurants on the Island. Tanca Manna sits approximately 250 metres from the road behind a saltwater lake. It has a great stretch of sand and plenty of facilities for families. A kilometre beyond Tanca Manna is Barca Bruciata, a small sandy beach which is quiet with no facilities. Cala Battistoni beach just in front of the little village of Baia Sardinia is a white sandy beach with a spectacular and natural surrounding. Cala Capra beach just beyond Golfo delle Saline is a pretty sandy bay tucked beneath the impressive Capo D’Orso headland with its distinctive bear shaped weathered rock. The Capriccioli headland has five beautiful small sandy beaches. There are facilities for boat hire and also a bar close to the beach. These beaches, including La Celvia, are amongst the most popular in the area. Rather off the beaten track is the Spiaggia del Principe which cannot be reached by car. The last stretch has to be done on foot takes under 10 minutes and is well worth the effort. A small secluded sandy beach near Marina. An extensive sweep of white sand set down a long unsurfaced road. Piccolo Pevero is a small sandy beach with parasol and boat hire. It also has a restaurant (“Il Pulcino”) and a bar. The Pitrizza beach at Liscia di Vacca just north of Porto Cervo is also popular. Sailing show organised by the Yachting Club of Costa Smeralda. A festival inviting visitors to sample fried fish and delightful Vermentino wine. Held during Tempio’s summer carnival and featuring various ethnic groups from all over the world. International Jazz Festival – one of the most important in Sardinia. Visit the prehistoric remains including the Albucciu Nuraghe – a bronze age tower, the Tomba dei Giganti Coddu Vecchiu and the Li Muri Necropolis, scattered around the town. Explore by car or on foot the dramatic mountains of the interior, the rugged countryside and the small character towns and villages. Alternatively, leave your car in Palau and take the stream train to Tempio Pausania, a spectacular journey across the Galluran countryside. Sample traditional Sardinian cuisine in a farm restaurant. Amongst others, we recommend the Agriturismi Tenuta Pilastru, la Sasima or la Somara, all located near Arzachena. Discover the exquisite coastline from the sea and enjoy the excellent conditions of the north east coast for wind-surfing, sailing, diving, snorkeling, etc. The water park in Baia Sardinia is bound to be a hit with children and adults alike. Spend a day cruising around and swimming from these stunning islands - a favourite with those seeking tranquillity, natural beauty and unspoilt surroundings. There are frequent ferries or boat trips available from Palau.